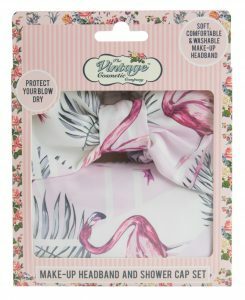 NEW YORK — The Vintage Cosmetic Co. will introduce three products to Ulta Beauty stores in February — the Headband and Shower Cap Set in flamingo print, the Cooling Gel Eye Pads with eyelash print and Peggy Make-up Headband in leopard print. Since their launch in Ulta stores four years ago, The Vintage Cosmetic Co. continues to grow in popularity. The company is known for their signature floral print and classically inspired beauty tools ranging from eyelash curlers to pampering products. The Headband and Shower Cap Set, selling for a suggested $9.99, is designed with practicality in mind. The shower cap keeps hair dry and frizz free, while the headband keeps hair out of the face during facial cleansing and makeup application. The Cooling Gel Eye Pads, selling for a suggested $3.99, are designed to refresh and sooth tired eyes. The soft Peggy Make-up Headband in leopard print, selling for a suggested $4.99, keeps hair away from the face, allowing consumers easy cleansing, applying make-up or relaxing while wearing a facial mask. These products will be available for purchase at Ulta Beauty stores across the U.S. and and online at www.ulta.com/brand/vintage–cosmetic–company.